You have heard for years that “the money is in the list”, that you have to have a list and that you need to send email newsletters or give away free offers…and you ignored (or half-assed) all of that. Then, thank heavens, you heard that email marketing is dying and you got away from even thinking about, except when that little voice in the back of your head said, “but I read emails still”. 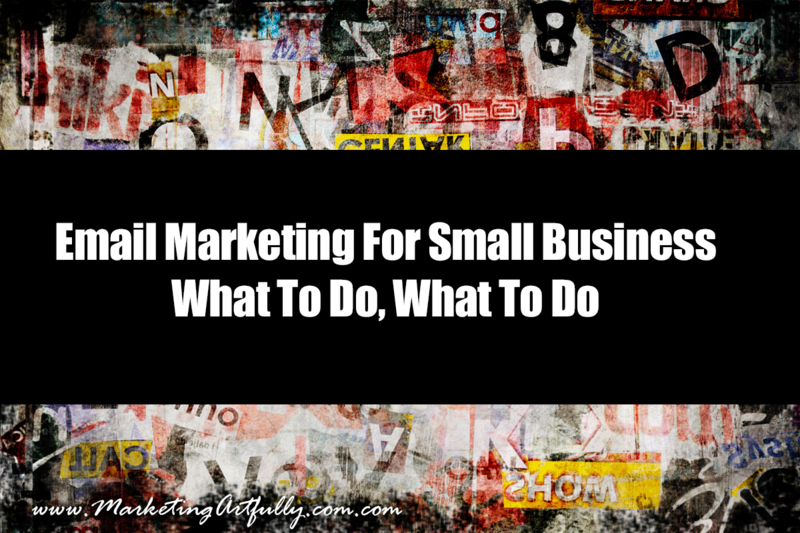 Seriously, you can try and get around the fact that you need an email list, you can gnash your teeth and complain about the time and expense, but can you really say that email marketing is dead? How many emails will you get in your inbox today that you requested from someone selling something? When was the last time you thought to yourself, “damn I hope I get to join five or ten new newsletter lists today?”, said nobody ever! You have to have interesting reasons for someone to join your list. Things that they want to have that you can provide. We give away a number of free marketing courses, marketing tools and other bits that people would actually want to have in exchange for giving us their email address. You don’t have to a big production either! One of our “best selling” give-ways is the 100 Free Marketing Ideas handout that we use for our speaking events. No additional effort AND we get to add them to our list. Today ends your lame subject lines. Stop sending out messages that say Sally’s Newsletter and start using powerful subject lines that will get your emails opened and read. We are bad at this, producing content at a furious pace without ever getting to the “ask”. Well that all changes this week. We printed out and reviewed every one of our email campaigns and will be including a call to action to buy a book, join another course, check out a blog post or any number of other awesome things that they can do which will result in sales for us. No one expects something for nothing and few people will offended if you provide great content AND the ability to extend the conversation beyond with a course, book or other item. What Email Service Should You Use? If you read this post and just decided to start an email list, we recommend you go with MailChimp. They offer free service up to a thousand or so list members and will do some of what you need to do if you are going to have a strong marketing campaign. If you are all fired up and know that you are going to fix your current systems or really start rolling, we recommend Infusionsoft (that is what we use). Infusionsoft is a huge database system that will let you do things like email data capture, list fulfillment, ecommerce, events, video marketing and more. One day I was all excited telling a client how cool a new marketing strategy was and that I would forward her the article. Well I got a shock when she said she didn’t want to read the article, she just wanted to know what I thought about the article and if it was something she should look into. Dang. That was so powerful and has driven everything I have produced from there on out. Your list people have signed up because you have some kind of expertise and they are looking to you for direction. Make sure you are giving them great content AND the input from you that they need to be able to use it.